After joining the Black Greek Organization, Kappa Alpha Psi, Willie Mathis realized it was difficult to find apparel with his fraternity’s logo. It wasn’t just Kappa Alpha Psi, it was that way for any Black Greek Organization, also called the Divine 9. Outside of college campuses, clothing to represent your respective fraternity or sorority wasn’t easy to find. Mathis changed that. He opened Perfect Apparel, a business dedicated to outfitting Black Greek members. Mathis started the company in his basement, working part time while he and his wife, Starla, worked full-time jobs. Eventually, they outgrew the basement and opened a brick-and-mortar store. They also left their full-time jobs to become full-time business owners. IMBM: How did the idea for Perfect Apparel come about? Willie Mathis: In the spring of 2009 I joined the Indianapolis Alumni Chapter of Kappa Alpha Psi Fraternity Inc. Upon crossing, it became glaringly obvious that Indianapolis was in need of a store that provided Divine 9 Fraternity and Sorority Apparel. From there, the business planning began and Perfect Apparel was chartered in the spring of 2011. What were some of the challenges you encountered early on? Early in the process, our business strategy was to simply purchase items from wholesale distributors and resale them in Indianapolis. We found that it was hard to control the quality of the product we were selling, and we would return many of the embroidered pieces that we purchased from wholesalers. This issue led to delayed customer shipments. We learned that in order to control the quality, we had to purchase our own equipment and when we did, it opened the doors to other markets. Can organizations, businesses or individuals purchase clothing from you if they aren’t Greek? 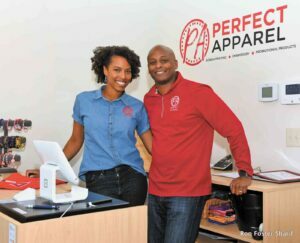 Perfect Apparel is a screen-printing, embroidery and promotional products business with a niche in the Divine 9 fraternity and sorority business. We embroider all types of garments for local businesses, churches, schools, private clothing brands, athletic teams and individual patrons. We do all of the embroidery and printing in house, so we embroider many upper left chest polos with corporate logos, hats with corporate logos, bags, etc. We have partnered with surrounding schools to provide spirit wear for parents and students, athletic uniforms for school teams and other athletic equipment. We work with a handful of local private label brands and print, fold, and bag T-shirts and other garments for them. And we also provide all of the promotional products that most companies use as giveaways during tradeshows or for gifts for their employees. For instance, we can provide branded pens, pencils, water bottles, backpacks, binders, car accessories, etc. When did you know it was time to become full-time entrepreneurs? When did you open the store? We knew it was time to grow the brand when we began getting random customers knocking at our door asking to shop. We would get calls from customers who lived in neighboring states wanted to stop by the “store” on their way through Indiana, and many times we had a basement full of college students shopping. During the last two years before we moved into the brick and mortar, we would set up our garage every week to coincide with a fraternity or sorority’s new membership intakes. One week our garage would be all Alpha Kappa Alpha items, the next Delta Sigma Theta. That’s when we knew we had to get the business out of the house. In October 2017, our brick-and-mortar store opened. We didn’t know what to expect, but when we opened the doors, we were slammed with custom orders immediately and business has continued to grow. We made the decision to leave our corporate jobs in the spring of 2018. Starla left her nursing job in March 2018, and I left my engineering job in May 2018. Did your business model change with the transition to a storefront? Any challenges to having a physical store? The business model changed drastically. As a web-based store only, we could afford to hold on to blank items and embroider them when a customer ordered it. As a brick and mortar store, we quickly learned that when people came in, they came to shop and we had to stock the shelves and racks with items. Early on, it was extremely hard to keep up with the demand. As soon as we’d get items on the floor to sell they’d be gone. We then had to increase our capacity. So we purchased additional embroidery machines in order to make more product. Other challenges we encountered were how to properly inventory our items, what systems to use to help us make intelligent business decisions, and how to arrange our stock room to allow us to know what we had on hand. During this time our focus on the e-commerce site slipped as well. We didn’t update our items as often as we once did, we had items in the store that wasn’t on the website and vice versa. It was hard, trying to keep up with the demand. What are some of the joys and challenges to operating your own business?